Whether you're visiting Los Angeles or you live in the Valley and want to escape for a weekend in nature, there are several National Parks within driving distance of Los Angeles. 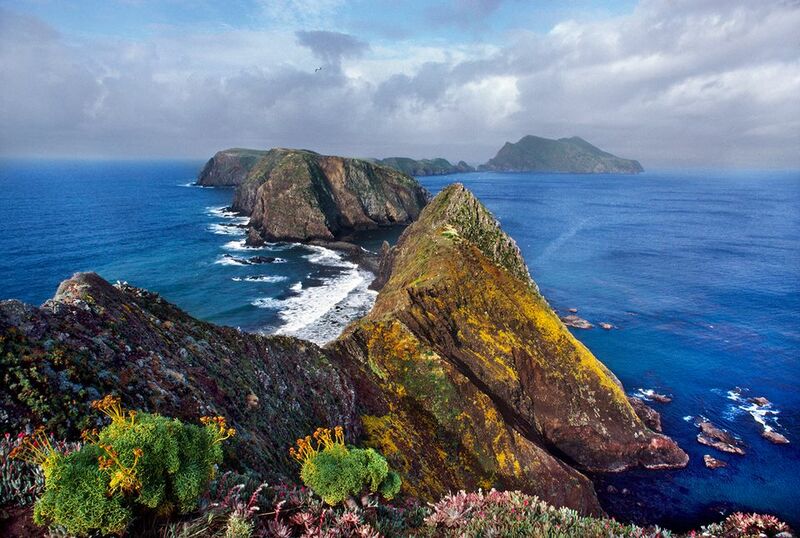 From taking a boat to the Channel Islands National Park a little over an hour north of the city to driving more than 12 hours to Oregon's Crater Lake National Park, there's no shortage of beautiful places to spend your vacation on the West Coast. Keep in mind that you'll likely need to stay overnight at or near many of these destinations—especially the ones that are over eight hours away. While some of these parks allow tent or car camping, you may have to book a hotel in a nearby town or city if you want to stay the night. Just over an hour north of Los Angeles (66 miles), you can embark on a journey to visit a set of five islands off the coast of Southern California known as the Channel Islands: Anacapa, Santa Cruz, Santa Rosa, San Miguel, and Santa Barbara. Anacapa is the closest island at just 14 miles from Ventura, which is great for visitors with time constraints, and offers the chance to scuba dive in Middle Anacapa and catch a glimpse of sea lions on Arch Rock. On the other hand, San Miguel is the furthest away at 55 miles from Ventura and is home to five seal species who mostly congregate around Point Bennett. Santa Cruz is the largest island and features the most diverse collection of wildlife among them, but visitors are only allowed on the eastern end due to strict restrictions put in place by The Nature Conservancy to preserve the environment of species like the island fox and island scrub jay. The Channel Islands are only accessible by park concessionaire boats and planes from the Visitor's Center in Ventura or by chartering a private boat elsewhere along the coast. Driving directions from Los Angeles are relatively simple: take the US-101, then take Exit 64 to Victoria Ave toward Channel Island Harbor, make a right onto Olivas Park Dr and follow it around to the Visitor's Center. 131 miles to the east of Los Angeles–on the other side of Palm Springs—Joshua Tree National Park contains over a million acres of desert landscape. Named for the yucca-like Joshua "trees" that create an ethereal and picturesque landscape in the California desert, this National Park is considered a sacred and ceremonial ground for different groups of people around the United States. Joshua Tree is great for rock climbing, hiking, birdwatching, wildflower photography, and excellent views of the stars at night. Occasionally, some event organizers even throw small festivals and gatherings throughout the year. When driving from Los Angeles to Joshua Tree, take I-10 east and then either exit toward Yucca Valley to enter the park from the north or continue on another 30 miles to the exit at Chiriaco Summit to come into the park from the south. Ranging from 1,500 to 14,494 feet in elevation, and there are two adjacent parks 218 miles north of Los Angeles that protect immense mountains, deep canyons, huge trees, and diverse habitats: the Sequoia and the Kings Canyon National Parks. The famous giant sequoia trees are among the largest living plants in the United States, and great groves of these trees—including the General Sherman Tree—can be found in Sequoia National Park. Here, you'll also find Mineral King Valley and Mount Whitney, the tallest mountain in the continental U.S. Nearby in the mountain wilderness of Kings Canyon National Park, you can explore two enormous canyons carved out by the Kings River as well as the summit peaks of the High Sierra that dominate the landscape. If you're driving from Los Angeles, you can take the I-5 North until you come to the turn-off for I-99 N toward Bakersfield / Fresno. Stay on I-99 N to Exit 30, toward CA-65 N to Porterville. When you come to Lindsay, turn right onto Road 204 N then right onto CA-198 E, which leads right into the park. Death Valley is the largest national park unit outside of Alaska and includes more than three million acres of wilderness area. This large desert, almost entirely surrounded by high mountains, also contains the lowest point in the Western Hemisphere. The area includes Scotty's Castle, the grandiose home of a famous prospector, and other remnants of gold and borax mining. Located about 266 miles northeast of Los Angeles, Death Valley is full of breathtaking views, unique geological features like the natural bridge and the Mesquite Flat Sand Dunes, and even several campgrounds, cabins, and a resort so you can spend the night in the park. Driving to Death Valley from Los Angeles takes about four and a half hours along CA-14 N, US-395 N, and CA-190 E.
Yosemite is home to some of the nation’s most spectacular waterfalls, meadows, and ancient sequoia trees and is located another 100 miles north of the Sequoia National Park, about 340 miles away from downtown Los Angeles. Within its 1,200 miles of wilderness, visitors can find all sorts of natural beauty—wildflowers, animals grazing, crystal clear lakes, and amazing domes and pinnacles of granite. Additionally, Mariposa Grove is home to more than 200 sequoia trees including the 1,500-year-old Grizzly Giant. As with the Sequoia and Kings Canyon National Parks, ​driving directions from Los Angeles are relatively simple. Instead of turning off from I-99 N, continue past until you get to Fresno, then take Exit 131 to merge onto CA-41 N toward Yosemite. About 486 (to 507) miles to the east of Los Angeles, the Grand Canyon National Park attracts over five million people each year. The main attraction of the park, the Grand Canyon, is a mammoth gorge that stretches over 277 miles and showcases amazing depths of colorful geology. It boasts some of the nation's cleanest air and much of the park's 1,904-square-miles are maintained as wilderness. Visitors cannot help but be blown away by stunning views from almost any vantage point. There are a variety of ways you can experience the Grand Canyon, including camping out overnight, going on a hiking tour, or even riding a mule down the steep slopes to the bottom. Additionally, there are several top-rated hotels and resorts within a short drive, and the nearby city of Flagstaff is a hidden gem of Arizona with plenty of places where you can dine, enjoy a show, or spend the night. There are a few ways you can drive to the Grand Canyon from Los Angeles, depending on which way you want to approach this massive attraction in the Arizona desert. No matter which way you decide to leave Los Angeles, you will eventually need to make your way up to I-40 via the I-15 N, the CA-177 N, or the US-60 before coming into Flagstaff; AZ-64 N will take you straight to the Grand Canyon from there. Lassen Peak erupted intermittently from 1914 to 1921 and, before the 1980 eruption of Mount Saint Helens in Washington, was the most recent volcanic outburst in the contiguous 48 states. Active volcanism at the park includes hot springs, steaming fumaroles, mud pots, and sulfurous vents. Located 563 miles north in California, the best time to visit this mountainous region is late spring to early fall. However, the best time for a scenic drive through the park is in August and September while the winter months offer the chance to cross-country ski or snowshoe. Driving directions from Los Angeles are fairly straightforward: take I-5 N 510 miles to Exit 649 onto the Volcanic Legacy Scenic Byway in Mineral (CA-36 E), which leads directly through the park about 50 miles later. Comprising 45 percent of all the old-growth redwood forest remaining in California, this park—together with four other parks in California—are a World Heritage Site and International Biosphere Reserve. The ancient coastal redwood ecosystem preserved in the parks contains some of the most majestic forests scenery anywhere in the world. At 734 miles from Los Angeles, you should plan on at least 12 and a half hours to make it up to the Redwood National and State Parks—and stopping halfway up the 101 isn't a bad idea so you can get a day-time view of the forests when you arrive. To get to the Redwood National and State Parks in northern California from Los Angeles, you can take the US-101 all the way up, but it saves you 40 miles and nearly an hour to take the I-5 N to the I-580 W before merging onto the US-101 in San Francisco. Once you've passed the city on the 101, take it north approximately 300 miles until you come to exit 753 for Newton B Drury Scenic Parkway. If you've got a long weekend to kill and want to take a trip to California's beautiful northern neighbor, Oregon, Crater Lake National Park is just 725 miles away from Los Angeles—and it will take you just under 12 hours to drive there. Formed when Mount Mazama, a now-dormant volcano, erupted in about 5,700 B.C. the crater left by the volcano collected rain over the centuries to eventually form Crater Lake, which is the deepest in the United States at 1,900-feet deep. You can easily get to Crater Lake from Lassen Volcanic National Park because you just need to follow I-5 past where you turned off for Lassen. From there, continue to the town of Weed, California, where you'll take exit 747 to US-97 N, the Volcanic Legacy Scenic Byway. Continue on US-97 N about 80 miles before turning left onto OR-62 W just after Modoc Point.